IV. EDIT ORIGINAL TRANSLATION AND SHARE IT! JU Translation is a translation tool integrated in our extensions that gives the possibility to translate, get and share translations. The main interface of the translation tool is accessible through the settings of the extension, in a tab named "Translations". In the main interface you'll find all your website language listed. A resume of the translation strings will be displayed and validate the step, you're done, your extension is now in french! Here is the process to add a new language translation to an extension. 1. Make sure your website is in Danish language for example if you want to add the Danish translation. WordPress language can be chosen from the Global settings or in case of a multilingual website added in WPML or Polylang. 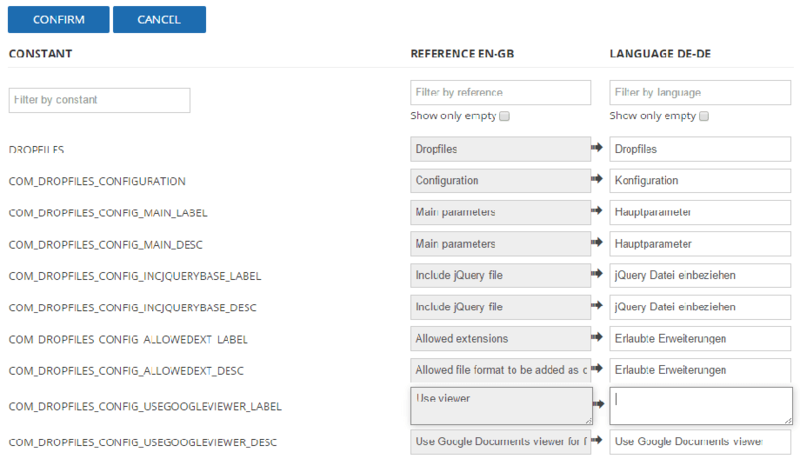 In Joomla, use the default language manager to add a language. ​If there's no translation available in your langue, a message will be displayed "No translation found". Click on "Edit original file" then start the translation. During the translation process you can check your current translation in your extension of course. And once you're done, please share your translation using the green button "Share with JoomUnited". The override process is about create a language that will be used in priority over the original one. The main advantage is that this overrided file will remain untouched on plugin update. From this file you can override only few strings, that's OK. Just hit the Override button. 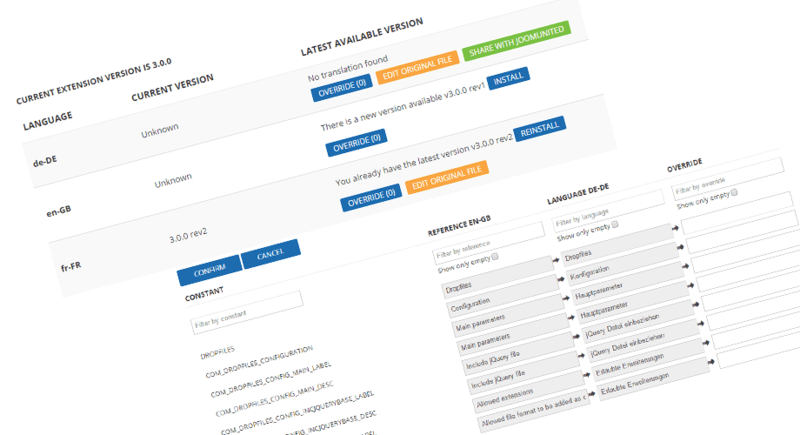 In the translation interface you'll find listed the constant (for Joomla) the reference in English, the language you want to override then you can add you own translation. The translation interface is pretty user friendly, like our extensions :) Some filters are available on the top part to quickly find what you're searching for or display only empty translations. Then hit the save button and your override is done! This button will lead you to a warning message to avoid editing an original file that will be erased on update. The idea of editing the original file is to share your translation with us and then we'll validate it as the reference for your language. On the next step you can start the translation. Finally, after your translation, just confirm it and then you can share your translation with us. You can also drop us a custom message. Translator Reward: We offer a new yearly licence for each new language translation per extension (check on the product page for the flags, meaning the languages currently available). Plus, we send a 30% OFF coupon, that applies on any membership, for each translation of more than 10% of an extension.